A man set a carpeted floor mat on fire and pushed a baby girl in a stroller toward it after an argument with his girlfriend, according to Arlington County Police. 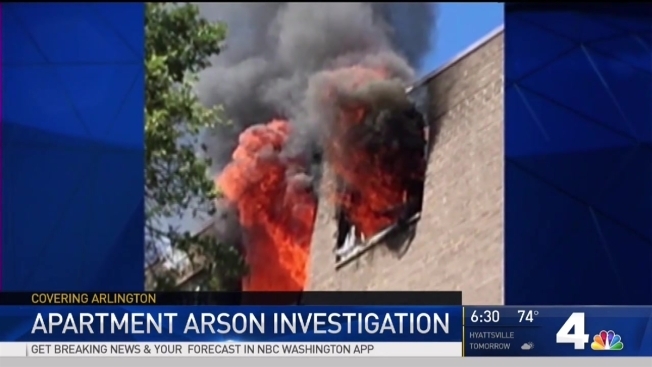 Demetrius Antonio Taylor’s argument with his girlfriend Saturday morning escalated into an assault, during which he started the fire in an eighth floor apartment at a building in the 5500 block of Columbia Pike, police said. The woman was able to safely get out of the apartment with her baby before the fire spread, police said. They were evaluated by a medic at the scene. Fire and smoke filled the apartment, police said. Officers were dispatched to the apartment building about 11:15 a.m. The Arlington County Fire Department was at the scene when officers arrived. A photo taken by the fire department shows flames shooting out of the windows. Taylor, 27, left the area before officers arrived, police said, but at about 4:30 p.m., police learned he returned to the area. Officers took Taylor into custody in the area of Columbia Pike and South Frederick Street without incident, police said, but he became combative in an interview room at the police department, kicking through a wall, spitting at officers and physically threatening them. Several dozen apartments need to be restored, and as many as 60 residents were displaced. They are being offered rooms, the apartment manager said. Most are expected to return to their apartments by Wednesday. Taylor was charged with arson, child endangerment, destruction of property, two counts of assault on law enforcement, and assault and battery. He is being held without bond. Taylor's mental health came up at his initial court appearance Monday, which had to be delayed from morning until afternoon because of a mental health episode in the jail.